Cupcake owns a bakery and his life has a certain routine to it. Wake up at 6:30 am, head to the bakery, bake, and then open the shop at 9:00 am, work until 4:00 pm, then spend time with his friend, Eggplant. Eggplant is planning a trip to Turkey to visit his family, who happen to know the very famous chef, Turkish Delight. When Eggplant invites Cupcake to join him on the trip, Cupcake has to work hard to make more money and pay for it. As he tries new things, his delight in baking returns. Perhaps the solution to his struggles is closer to home than he thought! Varon is the author of the very successful, Robot Dreams. While this graphic novel doesn’t have the power of that book, it is still a great read that children will respond to. The book also includes seven recipes for food that Cupcake makes in the book. All of Varon’s books have a winning quirkiness to them. Here you have Cupcake who creates cupcakes for other people to eat. A bit strange, but that’s what makes Varon’s worlds so intriguing. Her illustrations are just as clear and charming as always. The characters are expressive, funny and interesting. The text is fanciful and fun, often meandering a bit rather than driving the story forward. It reads and seems as if readers are really looking at Cupcake’s life. A whimsical graphic novel that is not too sugary at all. Appropriate for ages 8-12. Miriam was a baker who had her own little bakery where she made wonderful breads. She always saved the cinnamon bread for last because it was her favorite. As she made the bread, she sang the songs of her childhood, weaving them with the scent of cinnamon in the air. Then one day a young man named Sebastian bought some cinnamon bread and continued to by a loaf every day for a year. Finally, he proposed to Miriam and she said yes. Soon a baby was on the way, but when the baby arrived it cried and cried and cried. Nothing would settle the baby down until Miriam got a sudden idea and headed for the bakery with her family. She made every kind of bread with the cinnamon bread saved for last. And what do you think happened when her voice mixed with the cinnamon and sugar in the air? This modern magical story is simply delicious. Winstanley’s writing is gentle and strolling, building towards the story and throughout until it is neatly tied together by the end. There is a sense of ease, of simplicity and of love throughout the entire book that is very comforting and warm. Nadeau’s illustrations have a modern feel to them with their bright mix of yellows and pinks against browns and grays. At the same time, they feel timeless with the people riding bicycles, pushing prams, and the motif of curling wrought iron. This sweet story has the spice of cinnamon to keep it interesting and the warmth of bread baking to keep it filling. Appropriate for ages 4-6. A re-illustrated classic Golden Book that was first published in 1951, this book gets a charming new look. Pantaloon is a dog that loves to eat baked goods. So when a job opens at his local bakery, Pantaloon thinks he will be perfect for it. But the baker doesn’t. He thinks that Pantaloon will eat more than he bakes. Pantaloon even tries a disguise to get the job, but he’s discovered. While Pantaloon is in the barber shop getting his hair cut and trying to come up with his next plan, the baker heads out for more sugar. Unfortunately, he trips over Pantaloon’s bicycle on the way and ends up in bed. 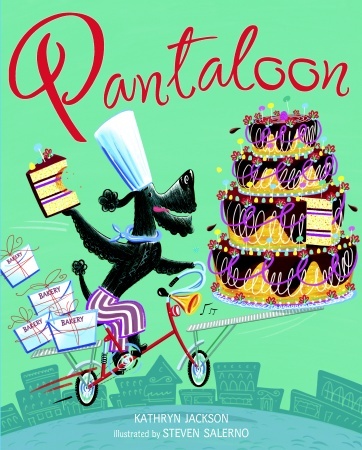 Pantaloon eagerly steps in and ices the cakes and delivers all of the goodies to customers. What will the baker say when he returns? Jackson’s text has an old-fashioned feel to it. It has very nice repeating lines that really tie the piece together. Pantaloon yearns for baked goods in a series of lines and the goodies at the bakery are listed in a winning way each time they are featured. Salerno’s illustrations have a retro feel to them, nicely complementing the feel of the text. His use of bright colors makes the book feel fresh and vibrant. A very nice read aloud for food or dog story times, this is a retro sugar-rush of a book. Appropriate for ages 3-5. Also check out the images on Steven Salerno’s blog of the old and new versions.